I staarted my Read The World challenge based on two facts (besides loving to read) 1) I love to travel and 2) I love history. I could live 1000 lifetimes and never travel everywhere I would like to go. 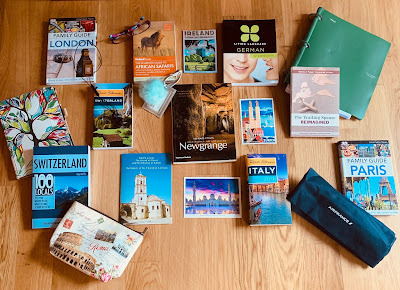 I don't have many travel books because I actually find the internet just as useful. I like to talk to my friends who have been there, and also read blogs of regular travelers to find out what they did. Off the beaten path, and gems that are hidden are my favorites. I have traveled my whole life. Growing up, we would take a few weeks each summer and make out way around the United States and Canada. We went to Disney World and on Caribbean cruises. We would hit New York City a few times a year to see musicals. When I got married, we continued to accumiulate states during our travels, and added Mexico. It wasn't until 2014 that I made my first international trip and I was hooked. I had been a nervous flyer growing up and was never sure I wanted to fly that far, but I quickly put that fear aside once I saw what I had been missing. It took a trip to Paris and London to know I would get on a plane 100 times a year if I could travel further and faster. We took in Italy two years ago, and then made the big move to Switzerland. Now we have added Germany, France, Austria, Lichtenstein, Ireland, United Arab Emirates, Cyrpus all to our list. Scotland is next month. Then Netherlands. Then Spain and Japan. I just want to go and go and go. Easy Jet is my new best friend. I don't have a favorite place so far because everywhere is so different. I am willing to try just about everything and anything to see different parts of the world. And the more World books I consume, the more I want to pack by bag and go. We actually started a blog when we moved to Switzerland in 2017. If you would like to check it out visit: Swiss Family Pletcher. It is a combo of our travels and life here as Expats. Do you have a favorite place you love to travel? If you could go one place in the world, where would it be? So many wonderful places you have already been! I know what you mean about the kids. Living in Europe makes it easier, of course. We have three kids and the youngest one is losing her vision to a genetic disease, so we go for her. I don't feel like I've travelled as much as a lot of ppl my age, but I LOVE Hanoi in Vietnam. From Melbourne, Australia my partner and I fly to Ho Chi Minh direct (that's like a 9 hour flight) for like AU$900 (probably like US$450ish) and another AU$60 for a return flight from Ho Chi Minh to Da Nang, the closest airport to Hanoi. My partner and I have been here like 3 or 4 time (going again later this yr) and absolutely love it. It's quiet, has a French riviera feel (I think), beaches, alcohol and food served to you on the beach and we have a local friend who takes us to all the best local restaurants and just INDULGE in the most AMAZING fresh seafood I have EVER tasted! The flavours are so fresh, to crisp and so YUMMY! I make sure I get the lemongrass clam chowder every time and our friend knows I need that in my first meal and always makes sure it's a winner. For us this is the PERFECT holiday locations with bars in town, a free shuttle bus into town and the myriad of restaurants within a few mins walking distance of our hotel. I LOVE it! I kept saying Hanoi and I meant Hoi An!! My bad!!! That sounds WONDERFUL. I am putting it on my list!